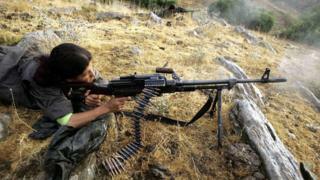 Who are Kurdistan Workers' Party (PKK) rebels? The Kurdistan Workers' Party (PKK) has been a thorn in Turkey's side for decades. The group, which has Marxist-Leninist roots, was formed in the late 1970s and launched an armed struggle against the Turkish government in 1984, calling for an independent Kurdish state within Turkey. Fighting flared up again after a two-year-old ceasefire ended in July 2015. Now the PKK is being targeted in a bigger Turkish security crackdown, following the botched July 2016 coup attempt against President Recep Tayyip Erdogan by mutinous Turkish officers. The PKK's struggle is also part of the turmoil in Iraq and Syria, where Turkey is trying to assert its influence on a battlefield with many rival forces. What are the PKK's ambitions in Turkey? In a BBC interview in April the PKK's military leader Cemil Bayik said "we don't want to separate from Turkey and set up a state". "We want to live within the borders of Turkey on our own land freely... The struggle will continue until the Kurds' innate rights are accepted," he said. Turkey continues to accuse the PKK of "trying to create a separate state in Turkey". More than 40,000 people have died in the conflict. It reached a peak in the mid-1990s, when thousands of villages were destroyed in the largely Kurdish south-east and east of Turkey. Hundreds of thousands of Kurds fled to cities in other parts of the country. In the 1990s, the PKK rolled back on its demands for an independent state, calling instead for more autonomy for the Kurds. The spotlight is now on Turkey's pro-Kurdish opposition party, People's Democracy (HDP), whose joint leaders Selahattin Demirtas and Figen Yuksekdag were arrested early on 4 November. The Turkish government said they had failed to appear for questioning about alleged links to the PKK - which they deny. Turkey accuses them of spreading PKK propaganda. Ten other MPs were also arrested. Acting with emergency powers, introduced after the coup attempt, the Turkish authorities have also detained the joint mayors of Diyarbakir, a mainly Kurdish city. The Kurds' main media outlets have also been shut down. The HDP, the main pro-Kurdish party, is a broad coalition of groups including liberal and left-wing ethnic Turks. The party denies Turkey's claim that it is allied to the PKK. It entered parliament for the first time last year, winning 59 seats, making it the second-biggest opposition party. What is happening in the Turkey-PKK conflict? South-eastern Turkey has been wracked by violence since the ceasefire with the PKK collapsed. Hours after the HDP politicians were arrested, a car bomb went off outside a police station in Diyarbakir. Turkish Prime Minister Binali Yildirim said it had killed eight people, including two policemen - and he blamed the PKK. The Turkish air force regularly carries out air strikes against PKK bases in mountainous northern Iraq. The Turkish government has ruled out any negotiations until the group completely disarms. There have been many PKK attacks on Turkish security forces in the south-east. In August 2016 a PKK car bomb in Cizre killed 11 policemen and injured 78. Hundreds of people have died in more than a year of clashes in Turkey's Kurdish-majority region. The PKK is listed as a terrorist organisation by Turkey, the EU and US. Human rights groups say many civilians have died during Turkey's anti-PKK offensive in the south-east. Turkey has imposed curfews and used heavy armour in urban areas in its fight with the rebels. What about the fighting in Iraq and Syria? Turkey has twin concerns about the Iraqi-Kurdish push to oust so-called Islamic State (IS) from Mosul. President Erdogan's AK Party, strongly rooted in Sunni Islam, does not want Iraqi Shia forces to spread their influence up to Turkey's borders and beyond. Nor does Turkey want the armed Kurdish groups to join up along its borders, bolstering the PKK cause. Turkey retains an army base at Bashiqa, not far from Mosul, and has trained a local militia force - the Ninevah Guards - consisting of Sunni Arabs, Turkmens and Kurds. In war-torn Syria, Turkey views the Popular Protection Units (YPG) - a Kurdish force fighting IS - as linked to the PKK. Turkey is allied to the US in Nato - but the US also supports the YPG in its anti-IS struggle. In July 2015, a suicide bombing blamed on IS killed 32 people in the mainly Kurdish town of Suruc, just inside Turkey, near war-ravaged Kobane in Syria. Kurdish groups accused the Turkish government of not doing enough to thwart IS operations. A Turkish military operation in August-September 2016, in support of allied Syrian rebels, ousted IS from border towns. Are there any peace initiatives? The PKK suffered a major blow in 1999 when its leader, Abdullah Ocalan, was arrested and jailed for treason. In March 2013, he called a ceasefire and urged PKK forces to withdraw from Turkey. But that ceasefire broke down in July 2015. It was not the first time a truce had been declared. Shortly after Ocalan's arrest, the PKK introduced a five-year unilateral ceasefire and tried to change its image and widen its appeal. It called for a role in Turkey's politics, more cultural rights for the country's estimated 15 million Kurds and the release of imprisoned PKK members. Turkey refused to negotiate with it and offered only a limited amnesty to its members. Between 2009 and 2011, high-level secret talks took place between the PKK and the Turkish government in Oslo, Norway, but they collapsed after a clash in June 2011, in which 14 Turkish soldiers were killed.